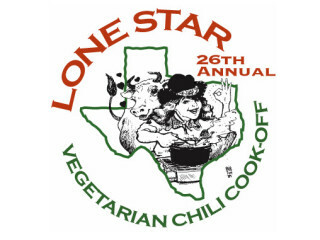 Vegetarians and non-vegetarians are invited to come to Round Rock for the 26th Annual Lone Star Vegetarian Chili Cook Off. There will be fresh and frozen desserts, libations, vendors, educational exhibits, entertainment, live music, a silent auction, animal outreach and (of course) lots of chili.. Admission is free to the event but your paid wristband gets you a bowl, a spoon and more chili than you can shake a ladle at. Wristbands cost $10 for adults (13 years and older), $7 for children 6 to 12 years old, free for children 5 and under and $8 for seniors, veterans and college students (with valid ID). Cook off contestants compete for cash prizes, trophies and bragging rights. The public will choose the best chili in the People's Choice award, while a group of celebrity judges will decide the winners of the Best Chili and Best in Show awards.